I Love Catherine LeDuke: Memorial Day - A Day To Confront That "Wall"
Sunday night I watched the Memorial Day Concert from Washington, DC; an event that has been held each year for 24 years and hosted by PBS. I admit to being a regular watcher of this concert as well as other patriotic events like the one put on at the Fourth of July. For the past several years this concert has been emceed by Joe Mantegna and Gary Sinise (Lt. Dan to all you Forest Gump fans). This year a major player was missing; Actor Charles Durning passed away in December. Charles Durning was a WWII vet who landed at Omaha Beach on D-day in 1944. Each year he could be counted on to deliver an incredibly meaningful reading of some sort; it might be a poem, a true story of some soldier's heroic actions, or on a few rare occasions recount some of his own recollections about his experiences in the service. Regular readers of this blog-site know that I have been living part-time in 1944 through James Neville and Catherine's letters. I thank PBS for the lengthy tribute paid to Charles Durning last night. It was an exceptional homage to a member of America's Greatest Generation. Most of Daddy's letters written during his 26 months of Army life spoke about his frustrations with the whole experience. He was well known, among his fellow soldiers, for his rants about the "insanity" of their daily existence. His disdain for authority was a regular theme in his letters, especially during his early training days at Camp Barkley. On one occasion, however, he let slip how much he actually enjoyed participating in the "end of training" parade held just before his unit finished basic training. The entire Battalion passed in review in front of assorted Generals and other dignitaries with the Army Band playing the usual "Sousa" tunes. Anyone who has been in the Military can relate to being swept up in the "Marching Moment." 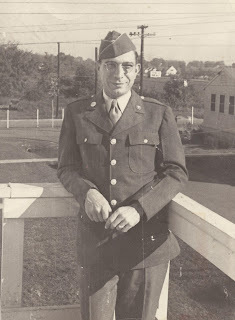 James Neville would have enjoyed the Memorial Day Concert and would have proudly stood up on cue when the Army Theme Song, "The Caissons Go Rolling Along", was being played. Actually, no one these days knows what a Caisson is, so someone changed the official title to: "The Army Goes Rolling Along." Daddy would have pointed to this change and made some sort of point about how this was a perfect example of the inane-ness of the Army; everyone should know that a caisson is a small brown mushroom grown only in the pacific. Maybe the Army's insanity was not really the problem. I followed my father's lead and reluctantly allowed myself to be drafted in 1966; almost twenty years to the day when he was finally discharged. I also shared his general dislike for Army life, his mild rebellion against military authority, and his pride on those rare occasions when called upon to march in dress uniforms on large parade fields with caissons rolling all over the place. Those who know me are aware that I have a bit of a hearing problem; one that almost kept me from being drafted. The Army took me anyway and in their infinite wisdom assigned me to the Artillery. This would be the same Army that my father railed about in each of the 600 plus letters he sent to my mother. I also felt a bit of his confliction about my service record just as he often expressed his own disaccord about not ever being sent overseas during WWII. I entered the Army during the time when the Vietnam War was almost at its peak. Following basic training I was sent to Fort Sill Oklahoma for Advanced Infantry Training (AIT as it was called at the time). I was in training there to learn to be a "forward observer"; a specialty which was very much in demand in Vietnam. A forward observer is the guy who crawls way up to the front and picks a nice spot on a hill so that he can tell the fellows with the cannons where to point them. At least I didn't have to stand next to the noisy things while they were going off. I have to admit to doing one very dumb thing; I have a certificate somewhere that identifies me as having finished first in my class after 8 weeks of AIT training. Not really a good thing to have on your record in time of War. However, "Someone" was looking out for me, because while virtually everyone else in my class was sent directly to Vietnam, I ended up being sent to Germany. That's right, I fought the Vietnam War in Germany. Not only that, three months after I arrived in Giessen, my wife of less than a year arrived. We spent the next 15 months on an extended honeymoon at the Army's expense. We took two trips to Amsterdam, one to Berchtesgaden in the Bavarian Alps, one to Venice, and two to Paris. As a note of interest, we just happened to be in Paris on the opening day of Peace Talks with the North Vietnamese in May of 1968; me in my GI haircut looking on while teargas was in the air from the Anti-War demonstrations that were going on around us. The "Wall" was opened in 1982 and although I had made a couple of trips to DC before 1998, I was never able to bring myself to visit it. Not because I could not bear to look at some of my buddy's names on the Wall. Not because I had any issue with the controversial design of the Memorial. Not because I was concerned about having some sort of emotional breakdown in full view of strangers. No, my reluctance was of a completely different nature. My reluctance was of a sort that linked my Dad's inappropriate shame about his own time during WWII. 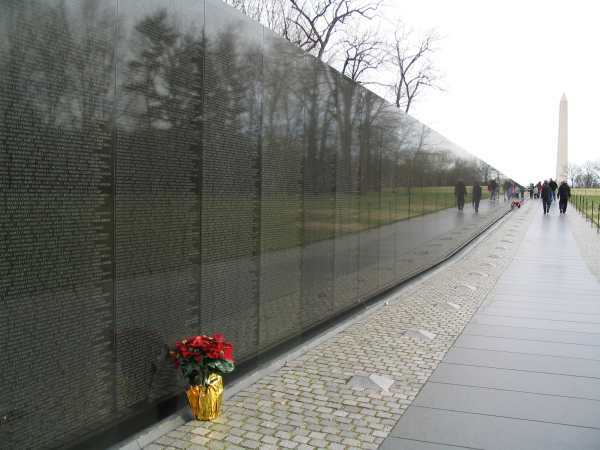 You see, I did not and still do not know even one of the 58,195 names on that Wall. Now I know several people who served in Vietnam. One of them was in my first wedding and remains a close friend today. Several of the men I went to basic training with and many of my fellow "forward observer" students went to Vietnam right out of training. I know that many of the men in my hometown are Vietnam Vets. And I will acknowledge that there may be more than one of these people who have their name "etched" on that Wall. But, shamefully, I do not know of them. I am not directly aware of knowing even ONE name on that wall. While others were experiencing the Horrors of War, I was on a camping trip through the Swiss Alps. While others were wading through rice paddies dodging bamboo spikes, I was touring the glass blowing tourist town of Lido outside of Venice, Italy. While others were experiencing the insults of anti-war protesters upon their return to the States, I was enjoying the experience of living with my wife in a German apartment in the suburbs of Giessen where my worst concern was having to carry coal for the hot water heater up three flights of stairs. The Vietnam War was my War. I am a Vietnam Era Vet. But the Vietnam Memorial Wall just did not seem like a place I should visit. As corny as it may seem, the Wall seemed to me to be Hallowed Ground that I had no right to tread on. I have no ax to grind with anyone who has not served in the Military. Had my "number" not been called in 1966 I really do not know if I would have volunteered. I had no political feeling one way or the other about that War. I lived in a bubble in the 1950's and 60's. I had no convictions concerning the Civil Rights issue, the Women's rights issue, or the Vietnam War issue. I am not proud of this statement; I was just a product of a small town, a simple lifestyle, and a mother and father that never did anything but love me. In 1998 my youngest daughter, Amanda, took a job in Washington, DC following graduation from the University of Louisville. As a prelude to her starting work I convinced her to let me take her to DC to help her find an apartment. Since I was bringing my magic checkbook, she agreed. Among other subjects while on this 1998 trip, I remember discussing my angst about my Military Service. Amanda has always been a good listener and a good encourager. During this particular visit Amanda convinced me that I should put all my past concerns behind me. We found her an apartment and then we made my first trip to the Wall. The Vietnam Memorial Wall, as I suspect most of you know, borders a fairly long and wide walkway. Visitors can enter at either end and proceed at their own pace. I started my walk and maintained a moderate pace. Since as I have stated I have no names in my mind to be looking for, I only paused occasionally. When I reached the other end I stopped and looked back to find Amanda looking more at the people that were there than at the Wall itself. It is an imposing creation and I was appropriately impressed. But my apprehension about being there or rather about belonging there did not experience any change; nor has it since that first encounter. I will not hesitate to visit again on my next visit to DC. I am proud that I served although I know that I only stood and waited. Sunday night as I watched the PBS Memorial Concert I gave thanks to all the veterans who have given their lives for this country. 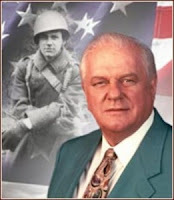 I am thankful to those of that Greatest Generation to which Charles Durning and James Neville LeDuke belonged. I am thankful to those that are still making that ultimate sacrifice today in Afghanistan and elsewhere. And I am thankful to those whose names are etched on a Wall in Washington DC who allowed me to share their Memorial if only for a day. I am truly aware that I am not on that Wall but for the Grace of God. This poem by John Milton is one that Catherine LeDuke can still recite from her fading memory. She wrote it in its entirety in a letter to James Neville to encourage him during a time when he was feeling that he was not doing his part when so many of the men he had become friends with were going "over" to either Europe or the Pacific. It helped. I know it helped.